NEW YORK, New York, March 9, 2016 (ENS) – International Women’s Day is officially celebrated every year on March 8, but this year, so much is happening that the day has expanded to a week-long series of events throughout the world. The United Nations observance on March 8 focused on how to accelerate the 2030 Agenda, building momentum for the effective implementation of the new Sustainable Development Goals, SDG. These 17 goals and their 169 targets balance the three dimensions of sustainable development: economic, social, and environmental. 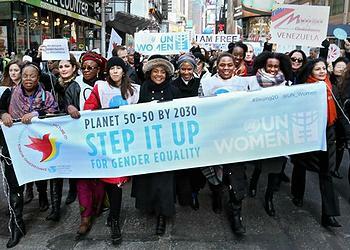 The UN observance focused on new commitments under the Step It Up initiative undertaken by the internal UN agency, UN Women, and other existing commitments on gender equality, women’s empowerment and women’s human rights. Wednesday morning in New York City, film stars with United Nations and New York City officials kicked-off the inaugural HeForShe Arts Week, a new initiative by UN Women to leverage the arts for gender equality. UN Women Goodwill Ambassador actress Emma Watson, SDG Advocate and UNESCO Goodwill Ambassador actor Forest Whitaker, First Lady of New York City Chirlane McCray, UN Women Executive Director Phumzile Mlambo-Ngcuka, The Public Theater’s Artistic Director Oskar Eustis, among others, took part in the launch. The HeforShe Arts Week runs from March 8-15, with more than 30 partners throughout the city of New York: ballets, operas, Broadway shows, music concerts, theatres, cinemas, galleries and museums. They are highlighting gender equality and women’s rights and donating a percentage of their proceeds to UN Women. In Washington, DC, First Lady Michelle Obama marked the one-year anniversary of Let Girls Learn, a project that brings together U.S. government agencies to address the challenges preventing adolescent girls from attending and completing school. 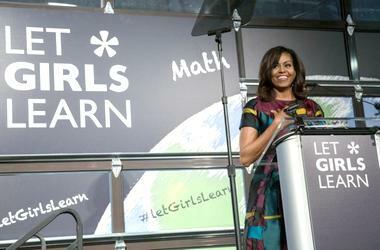 Speaking to an audience of girls and women, Obama told of how she first got engaged in the issue of girls’ education. Obama spoke of girls’ “burning determination” to get an education in the face of this discrimination. “These girls risk everything – the rejection of their communities, the violation of their bodies – everything, just to go to school each day,” she said. American Peace Corps volunteers are now running more than 100 girls’ education projects in 22 countries. And through Let Girls Learn, dozens of major companies and organizations have come forward to support this work, said Obama, including Lyft, Jet Blue, Proctor & Gamble, Johnson & Johnson and Starwood Hotels. 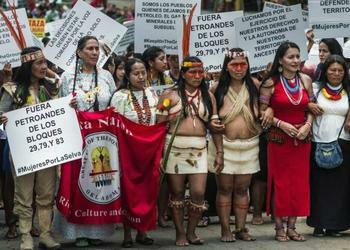 In Ecuador, indigenous Amazonian women leaders of seven nationalities and their international allies took action in the Amazon jungle town of Puyo, in a forum and march in defense of the Amazon, Mother Earth and for climate justice. They gathered to denounce a newly signed oil contract between the Ecuadorian government and Chinese oil corporation Andes Petroleum. By plane, foot, canoe, and bus, some 500 women mobilized from deep in their rainforest territories and nearby provinces, marching through the streets of Puyo. Chanting, “Defend the forest, don’t sell it!” and carrying signs reading “No more persecution against women defenders of Mother Earth,” the march culminated in a rally in which each nationality denounced the new oil threat and shared traditional songs and ceremonies. “Right now the oil company is trying to enter our territory. That is our homeland, this is where we have our chakras (gardens), where we feed our families. We are warriors, and we are not afraid. We will never negotiate,” declared Rosalia Ruiz, a Sapara leader from the community of Torimbo, inside the Block 83 oil concession. “Although we are from three different provinces, we are one territory and one voice,” said Alicia Cahuiya, a Waorani leader. As the march unfolded, the Ecuadorian government and Andes Petroleum held a meeting in the nearby town of Shell to organize an illegal entry into Sapara territory, knowing that key leaders would not be present. Outraged, a delegation of Sapara delivered a letter to the meeting, underscoring their opposition to the oil project and government tactics to divide the community. They successfully thwarted the government and company plans, and returned to the streets, victorious. A tribute was held in honor of Berta Caceres, the Honduran indigenous environmental leader who was killed last week for blocking a dam project in indigenous territory. The women of the Amazon were joined by Casey Camp Horinek, WECAN delegation member and indigenous leader of the Ponca Nation of Oklahoma, who shared her traditional songs and stories of how her people have been impacted by fracking. The March 8 forum, action and press conference was followed by a March 9 event, “Women of Ecuadorian Amazon and International Allies Stand For Protection of the Amazon Rainforest” at the library of FLACSO university in Quito. In India, the first all-women crew completed their maiden voyage on the Indian Navy sailing vessel Mhadei, traveling from Visakhapatnam to her home port, Goa, after participating in the International Fleet Review. These women officers are training to form an all-women crew that would attempt to circumnavigate the globe in 2017. In Nakorn Pathom, Thailand on March 7, UN Women, the Police Cadet Academy, Thailand Institute of Justice and the Embassy of Sweden came together to organize the Youth Dialogue on Gender Equality with Police Cadets. Mlambo-Ngcuka (say mlam-bo hu-ka) is living proof. That work will be continued during the upcoming 60th Session of the Commission on the Status of Women, the single-largest forum for the advancement of the women’s empowerment agenda. Running from March 14-24, this session is the first to take place within the new 2030 Agenda for Sustainable Development. The priority theme will be women’s empowerment and its link to sustainable development, and the review theme is ending violence against women and girls. This year over 8,100 NGO representatives have registered for the meeting, and a record 208 events are scheduled. 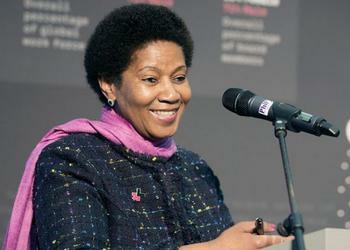 NGOs will organize 450 parallel events in the vicinity of the United Nations Headquarters.